Have you ever eaten milk-fed veal? I personally do not eat it because of how it is made. Once the calf is born, it is restrained on the floor so that it cannot move. It is then fed nothing but milk for its entire life. After all of this, it is butchered and sold. I am not writing this as a condemnation of veal (although I could), but instead to ask a question. Are you spiritual veal? Here is what that would look like. After the new birth, they choose to remain inactive. Whether this is through fear or a lack of conviction, they never get busy with the obedience that their faith was designed to produce. By keeping themselves weighed down, the never develop their spiritual muscles. We must exercise ourselves to godliness. The time to develop spiritual strength is before trials come. In the middle of a spiritual battle is not the time to begin getting ready. While it is important that when we are new Christians we “as newborn babes, long for the spiritual milk which is without guile, that ye may grow thereby unto salvation;” (1 Peter 2:2 ASV) we cannot stay that way! Just as it is necessary for a baby’s diet to change while growing, we must take in nourishment appropriate to our spiritual age. So is being spiritual veal a big deal? I mean, does it really matter? YES! 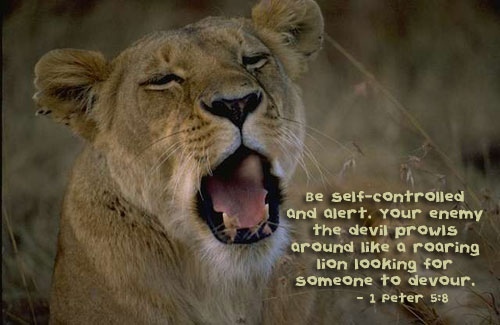 The devil is prowling about as a roaring lion seeking whom he may devour, (1 Peter 5:8) and a weak veal Christian is likely to be exhausted and fall away. Do not be deceived. Satan wants you dead and being spiritual veal makes it easier for him. And since we are engaged in a spiritual battle, your fellow soldiers need you to be strong. A weakened veal Christian makes those around him or her more vulnerable to attacks of the enemy.